It’s one thing when the proverbial fox guards the henhouse, it’s another when it basically runs it, using it to its advantage. 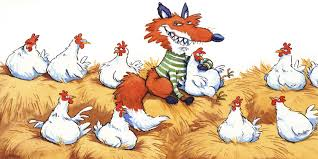 That’s great for the fox – usually not so good for the hens. The same thing can happen with “your” facilities and contractor data. And you don’t want to be the hen. While not a widespread practice, there’s a disturbing trend where some facilities management (FM) software platform vendors are migrating into the contracting business – and most concerning – leveraging their customers’ own FM data to benefit their interest in their own contracting businesses at the expense of their clients. Sounds a bit sketchy? It is. How does this work? And why should you as a retail, restaurant or convenience store chain facilities manager responsible for the repair and maintenance of lots of locations, be apprehensive? Any situation, where your FM software platform has eyes into your work order, RFP and contractor data and is then ‘bidding’ for your work – is ripe for, if not the definition of – a conflict of interest. Let’s say you use your FM system and put out a bid to your set of vetted and qualified contractors for HVAC preventive maintenance, plumbing repair, snow plowing – whatever. Your contractors all bid for the work appropriately. However, your FM software platform vendor who has its own set of in-house contractors – and access to your data including what everyone else is bidding(!) – joins the bidding process as well. Any FM software platform in such an arrangement (with access to your data and the bidding for your service work) can’t ignore looking at and using your data to its own advantage. There’s such a tremendous incentive to use that access to support its own contracting business interests. The result? Existing contractors who may be more qualified for the job get continually underbid by your FM software platform vendor who is “gaming” the process. Over time the right contractors, who keep getting underbid due to this manipulation, will leave your business and you’ll lose the long term relationships you’ve formed with them. And you’ll probably experience an overall degradation in the quality of your service work. In a way, this is similar to a practice on Wall Street where firms have visibility into the buy/sell orders of clients, and use high speed technology to jump in ahead of them to profit. FYI – this so called ‘front running’ is illegal in that setting. Owning the FM Stack eliminates the competitive nature of the contractor sourcing process. While this may initially seem cheaper, most of the contractors that are not ‘in-bed’ with the software company will walk away and no longer seek your business. So you’re quickly left with no choice in contractors, and are highly dependent on your software vendor’s own contractors and their non-competitive pricing. And that’s definitely more expensive. As you know, the quality of your contractor is one of the most important selection criteria you have when deciding who’s going to maintain your store operations, and hence, your company’s Brand Uptime. If others become responsible for driving contractors to you, can you even be sure they’re properly certified, insured and qualified per your requirements? You’ll find yourself soon asking if the ‘winning’ contractor for your work is as qualified as one with which you have built a relationship and trust. 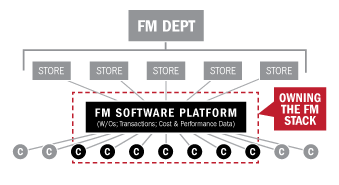 This “stacking the deck” by owning the FM Stack is the antithesis of how ServiceChannel works. Our mantra has always been and will always be, to provide our clients with an independent and verifiable source of your contractor cost and performance data. Only with an objective way of analyzing, measuring and acting on your data can you be assured of the most efficient and cost effective results for your company with no conflict of interests. So beware of any FM software platform vendor that is also ‘buying the work’ that its system is managing, removing contractor competition for your business and looking towards an endgame where they can eventually charge anything it wants. Always look for an alternative platform vendor that treats your data as your data, and is solely focused on helping you manage your FM program to your advantage – and not someone else’s.